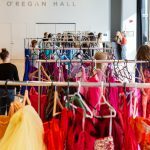 On Saturday, February 9, Paul O'Regan Hall was transformed into the closet of every princess' dreams. The space was filled with dresses, shoes, and jewellery—all available for free. See some magical moments from this colourful event. We danced, we sang, we had a ball. On December 13, the witches and wizards of Halifax came out to celebrate the 4th Annual Yule Ball in Paul O'Regan Hall at Halifax Central Library. Click through to read all about it and view a gallery of photos from the magical evening.